Foveal hypopalsia (FH) is typically seen in association with diseases like albinism and aniridia, and familial FH (FFH) is very rare. The authors present a case of unique association of FH with dyschromatosis universalis hereditaria (DUH). Family members of this patient had history of nystagmus and dermal pigmentary anomalies, suggesting that this may represent FFH with DUH in X-linked pattern. The authors also discuss the role of pigment anomalies in manifesting as this combination. We present a hitherto unreported association of FH with DUH in a young Indian male. We also hypothesize pigment anomalies to be the reason behind this unique association. A 32-year-old male presented with poor vision in both eyes accompanied by an involuntary motion of both eyes. The best-corrected VA was 6/36 in right eye and 6/24 in left eye at presentation, both with a myopic spherical error of −1 diopter. He was noted to have a horizontal jerk nystagmus of the manifest latent type without a null position. The anterior segment evaluation was unremarkable. The iris was normal in color and size, with no transillumination defects. Fundus examination was difficult due to the nystagmus but revealed normal pigmentation with an absent foveal reflex in both eyes. Spectral-domain OCT (Cirrus; Zeiss Meditec, Dublin, CA) was done, which confirmed the absence of foveal depression and presence of all the retinal layers in the expected location of the fovea (Figure 1). 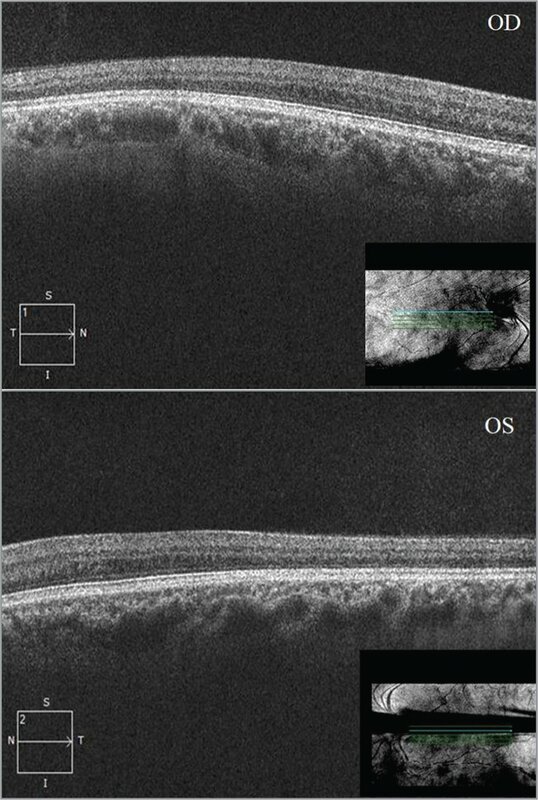 Optical coherence tomography images showing absence of foveal contour and continuous inner and middle retinal layers in the locale of the presumed foveal region. The inset infrared images guide the location of the fovea despite the nystagmus. Clinical photograph demonstrates diffuse interspersed hypopigmented and hyperpigmented macules on trunk and limbs. Upon detailed workup, he was found to have multiple hyper- and hypopigmented lesions over his trunk, thighs, legs, and arms. The lesions were dense on the trunk and thighs, whereas the palms and soles were not involved. His face showed mild involvement. The hair, nails, teeth, and mucosae appeared normal. There was no apparent atrophy, erythema, or telangiectasia. Additionally, there was no history of photosensitivity, photophobia, or handling any chemical directly. No other systemic anomaly was seen. 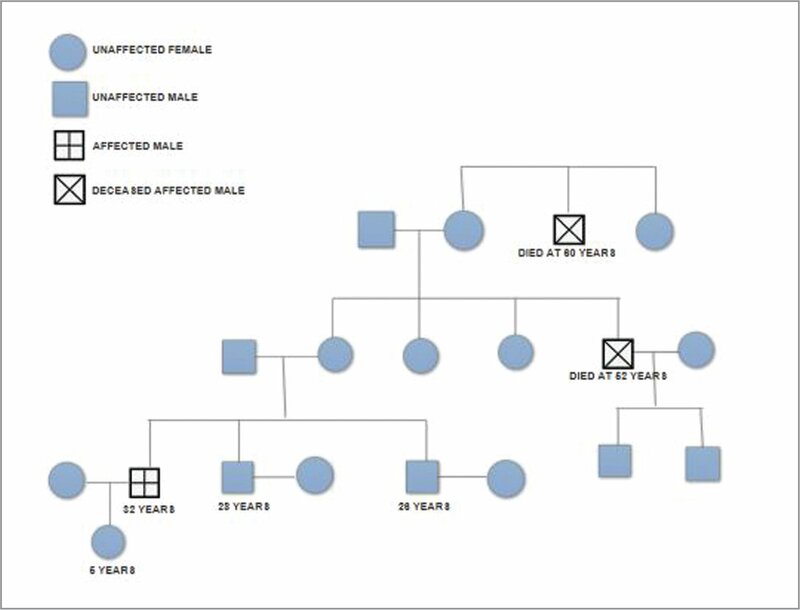 Three-generation-linked pedigree analysis was then charted (Figure 3). There was a definite history of nystagmus in the family as presented in Figure 3 (confirmed by the mother of the patient), along with skin lesions exactly similar to that of this patient. Although there was no known record of the first-generation maternal uncle's eye examination, the maternal uncle of the patient was known to have undergone an ocular evaluation and had been diagnosed to have some “retinal disease.” They were not available for eye examination for confirmation with OCT, as they had died due to natural causes in middle to old age (Figure 3). Examination of the rest of the available family members, including siblings and children of the index case, revealed no skin or eye findings. Hence, our case was labelled to have familial FH (FFH) with DUH in an X-linked pattern of inheritance. Visual prognosis was explained to the patient and he was advised a genetic evaluation. A three-generation pedigree chart depicting the X-linked inheritance pattern. FH type 1 is associated with mutations in the PAX6 gene (11p13) that are inherited in an autosomal dominant pattern, whereas FH type 2 involves homozygous mutations in the SLC38A8 gene (16q23.3).7 The gene responsible for DUH has been mapped to 6q24.2-q25.2. Other genes associated with DUH or its variants include 12q21-q23 and the ABCB6 gene (605452) on chromosome 2q35. Because the exact biochemical basis of the gene defect is unknown, the diagnosis generally relies on the external phenotype.8,9 Although the majority of cases show autosomal dominant pattern of inheritance with variable penetrance, a few patients have inherited it in an autosomal recessive fashion. In our case, the patient's maternal uncle (MU) and MU's maternal uncle had similar complaints, suggesting an X-linked recessive inheritance. Although the association between DUH and FFH has not been reported earlier, the X-linked pattern of inheritance seen in our case is very rare. Though it is possible that our patient had two distinct genetic disorders by sheer chance, a genetic linkage must be suspected as the inheritance pattern is uncommon for either of them.7 Due to expenses involved, gene mapping was refused by the patient, which is a limitation of this report. Both previously affected males were not available for examination, which is another important limitation of this report. The history of nystagmus and the skin condition in them was confirmed by another informant (mother), and therefore FFH and DUH were presumed. To summarize, this report describes a previously unknown association of FH and DUH. OCT proved a useful tool for analysis despite nystagmus and should be employed in management of such cases. Kantharaj GR, Siddalingappa K, Chidambara MS. Dyschromatosis universalis: Autosomal dominant pattern. Indian J Dermatol Venereol Leprol. 2002;68(1):50–51. From the Department of Ophthalmology, All India Institute of Medical Sciences, Saket Nagar, Bhopal, India (BT, PR, VS); and the Department of Dermatology, STD & Leprosy, All India Institute of Medical Sciences, Saket Nagar, Bhopal, India (DPA, RR). Address correspondence to Priyanka, MS, Department of Ophthalmology, All India Institute of Medical Sciences, Saket Nagar, Bhopal, India; email: priyankapmch1@gmail.com.